Reports of sclerosing angiomatoid transformation (SANT) in the pediatric age group are rare. We present a case of SANT in an 11-year-old child with a history of trauma presenting with rapidly growing splenic lesion since 2 months. A partial splenectomy revealed a well-demarcated nodular lesion 5 × 4 × 4 cm with central area of fibrosis. Most part of the lesion showed ill-defined nodules or diffuse areas of plump epithelioid appearing endothelial units that marked with CD31, but the internodular stroma was inflammatory pseudotumor (IPT)-like with a mitotic count of 1-2/10 hpf. The angiomatoid nodules were diffusely positive for CD31, CD163, and CD68; however, they were negative for CD34, CD30, smooth muscle actin, and CD8. Epstein-Barr virus-encoded RNA in situ hybridization (EBER-ISH) was negative. The MIB1 labeling was fairly high in the IPT area but low in the angiomatoid areas. After the diagnosis of SANT, the patient has had an uneventful follow-up for more than 3 years since surgery. The morphologic findings in the case being discussed reaffirm the finding that SANT may have an IPT component and it can be seen even in pediatric age group. Sclerosing angiomatoid nodular transformation (SANT) was first described by Martzel et al. as a unique vasoformative lesion composed of angiomatoid nodules with sclerosing rims of collagen fibrils around most of them. Most of these reports describe this entity in adults with only 2 case reports of SANT in pediatric age group. ,,,, Although angiomatoid nodules are the hallmark of SANT the fibroblastic stroma may be overwhelming and it has been recently shown that SANT is closely related to inflammatory pseudotumor (IPT) in the spleen. Our aim is to report the morphologic spectrum and the IPT-like stromal proliferation in a pediatric patient with SANT with an uneventful follow-up. An 11-year-old boy presented in September 2007 with increasing pain in the left flank since 2 months. The patient gave history of trauma before 2 months while playing. During evaluation, except for the raised serum LDH (lactate dehydronase) level (520 mg/dL) and erythrocyte sedimentation rate (ESR), all other hematologic and biochemical parameters were within the normal limits. A computed tomography (CT) scan revealed a hypoattenuating mass in the spleen measuring 4 × 5 cm. The patient underwent partial splenectomy for the mass. The partial splenectomy specimen weighed 125 g and measured 11 × 5 × 3.5 cm. 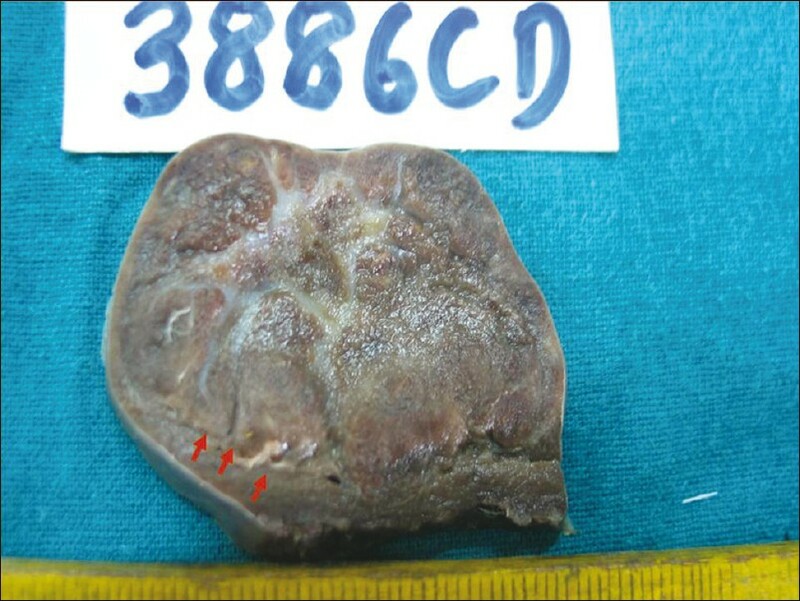 The cut surface revealed a well-circumscribed unencapsulated lesion with bulging cut surface and a central fibrotic scar measuring 5 × 4 × 4 cm [Figure 1]. Whitish central fibrous septae ran through this lesion from the center dividing it into lobules. Adjacent splenic parenchyma was unremarkable. The excised specimen was processed routinely. 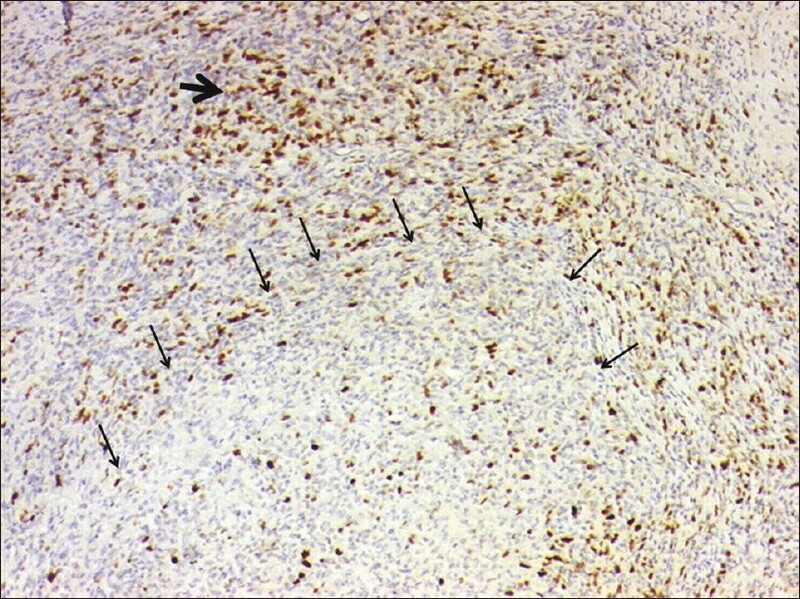 Immunohistochemistry was carried out using the avidin-biotin complex method; the antibodies used were LCA (1:100, Monoclonal, DAKO, Netherlands), CD31 (1:50, Monoclonal, Novocastra, Newcastle, UK), CD163 (1:100, Diagnostic Biosystems, California), CD68 (1:50, DAKO, Netherlands), smooth muscle actin (SMA; 1:400, DAKO, Netherlands), CD34 (1:200, DAKO, Netherlands), CD21 (1:40, DAKO, Netherlands), CD8 (prediluted, Novocastra, NewCastle, UK), CD30 (1:40, DAKO Netherlands, UK), MIB1 (1:200, DAKO, Netherlands). The Epstein-Barr virus (EBV) was demonstrated by using the in situ hybridization detection kit (Novocastra). A positive signal was recognized as intense blue/black nuclear staining under a light microscope. The histologic evaluation replicated the gross and showed a partly nodular lesion divided into lobules by the fibrous septae. Two distinct pathologic processes were appreciated. The large component was composed of variable-sized hemorrhagic angiomatoid nodules comprised of epithelioid cells with abundant cytoplasm, grooved nuclei with occasional mitosis. 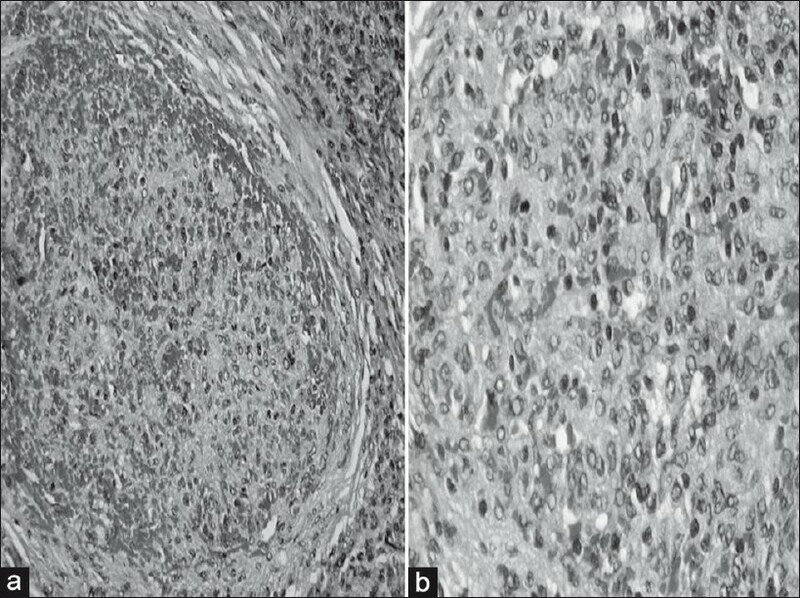 The periphery of some nodules showed a definite concentric rim of fibroblasts and collagen fibrils [Figure 2]a and b. The internodular area in the center of the lesion resembled an IPT with storiform pattern, mild nuclear atypia, and a mitotic count of 1-3/10 hpf [Figure 3]a and b. Lymphocytes and plasma cells were also seen within the angiomatoid nodules. Gamma-Gandy bodies with foreign body giant cell response were noted in the fibrous septae. The angiomatoid nodules were diffusely positive for CD31, CD163, and CD 68; however, they were negative for LCA, CD21, CD8, and SMA. In between the epithelioid endothelial cells were the SMA and CD34-positive venous channels. MIB1 labeling was 10%-15% in the epithelioid cells within angiomatoid nodules while the IPT component showed high MIB1 labeling (40%) in keeping with high proliferation [Figure 4]a and b. Epstein-Barr virus-encoded RNA in situ hybridization (EBER-ISH) was negative. After the diagnosis of SANT, the patient was followed-up and he is symptom free with no radiologic evidence of disease 3 years and few months since his surgery. The differential diagnosis of SANT includes the whole spectrum of vasoformative lesions in spleen, namely, splenic hamartoma, littoral cell angioma, angiosarcoma, and congestive splenomegaly. A splenic hamartoma, which represents hyperplasia of red pulp, was ruled out in view of the gross distinctness and nodularity of the lesion. A littoral cell angioma (LCA) shows dual differentiation potential with expression of histiocytic markers, such as CD68 and CD163, in addition to CD31 and CD21 but lacks CD34 staining. The nodularity, lack of cavernous vascular spaces with lack of CD21 ruled out an LCA. Likewise, age and obvious lack of features of malignancy helped in ruling out an angiosarcoma. The IPT-SANT connection has emerged only recently and many cases of so-called splenic IPT are now confirmed to be in fact SANT, with sheets of inflammatory fibrosis replacing angiomatoid nodules that may have developed over time. , The majority of the patients with IPT of spleen present with B symptoms, including weight loss, fever, and abdominal pain, very similar to those in some SANT patients. The high LDH and ESR in the patient we discuss were also in tune with the finding of an IPT component in the SANT. The histomorphology of the lesion we report was slightly different from SANT with IPT reported by Diebold et al. , in that the IPT component was cellular, mitotically active and the nodularity and sclerosis within the angiomatoid nodules was of a lesser degree. It is postulated that some IPTs arising in the liver or spleen are actually EBV-associated FDC neoplasms and the term inflammatory pseudotumor-like follicular dendritic cell tumor might be a more appropriate designation for this group. In tune with their neoplastic nature most IPTs in spleen show at least definite focal nuclear atypia that far exceeds the spectrum of reactive changes. Hence the finding of brisk mitosis in IPT areas as seen in the patient we report would not be typically surprising. Thus SANT and IPT in spleen form an interesting continuum and connection. The morphologic findings in this pediatric case further confirm that this association occurs across the age groups. The high proliferation within the inflammatory stromal component initially prompted a diagnosis of sarcoma were it not for the identification of few typical sclerosing angiomatoid nodules on SANT in the lesion. Following the diagnosis of SANT, the patient has had an uneventful follow-up for 3 years since surgery which attests to the benign nature of the process. 1. Martel M, Cheuk W, Lombardi L, Lifschitz-Mercer B, Chan JK, Rosai J. Sclerosing angiomatoid nodular transformation (SANT): Report of 25 cases of a distinctive benign splenic lesion. Am J Surg Pathol 2004;28:1268-79. 2. Diebold J, Le Tourneau A, Marmey B, Prevot S, Müller-Hermelink HK, Sevestre H, et al. Is sclerosing angiomatoid nodular transformation (SANT) of the splenic red pulp identical to inflammatory pseudotumour? Report of 16 cases. Histopathology 2008;53:299-10. 3. Bamboat ZM, Masiakos PT. Sclerosing angiomatoid nodular transformation of the spleen in an adolescent with chronic abdominal pain. J Pediatr Surg 2010;45:E13-6. 4. Kuybulu A, Sipahi T, Topal I, Uner A. Splenic angiomatoid nodular transformation in a child with increased erythrocyte sedimentation rate. Pediatr Hematol Oncol 2009;26:533-7. 5. Awamleh AA, Perez-Ordonez B. Sclerosing angiomatoid nodular transformation of the spleen. Arch Pathol Lab Med 2007;131:974-8. 6. Abbott RM, Levy AD, Aguilera NS, Gorospe L, Thompson WM. From the archives of the AFIP: Primary vascular neoplasms of the spleen: Radiologic-pathologic correlation. Radiographics 2004;24:1137-63. 7. Cheuk W, Chan JK, Shek TW, Chang JH, Tsou MH, Yuen NW, et al. 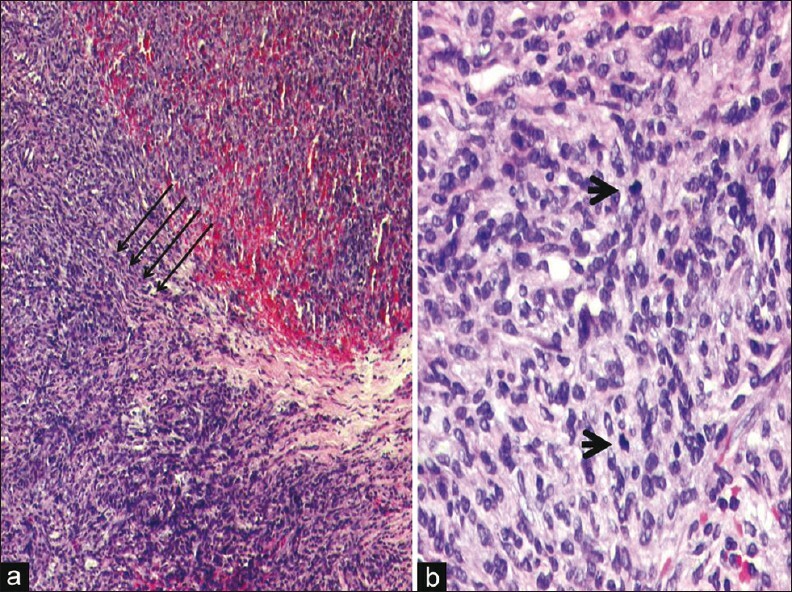 Inflammatory pseudotumor-like follicular dendritic cell tumor: A distinctive low-grade malignant intra-abdominal neoplasm with consistent Epstein-Barr virus association. Am J Surg Pathol 2001;25:721-31. 8. Weinreb I, Bailey D, Battaglia D, Kennedy M, Perez-Ordonnez B. CD30 and Epstein-Barr virus RNA expression in sclerosing angiomatoid nodular transformation of spleen. Virchows Arch 2007;451;73-9. 9. Lewis JT, Gaffney RL, Casey MB, Farrell MA, Morice WG, Macon WR. Inflammatory pseudotumor of the spleen associated with a clonal Epstein-Barr virus genome. Case report and review of the literature. Am J Clin Pathol 2003;120:56-61. 10. Nagai Y, Hayama N, Kishimoto T, Furuya M, Takahashi Y, Otsuka M, et al. Predominance of IgG4+ plasma cells and CD68 positivity in sclerosing angiomatoid nodular transformation (SANT). Histopathology 2008;53:495-8.